Georgia-Pacific manufactures tissue, pulp, paper, packaging, building products, and paper-related chemicals. 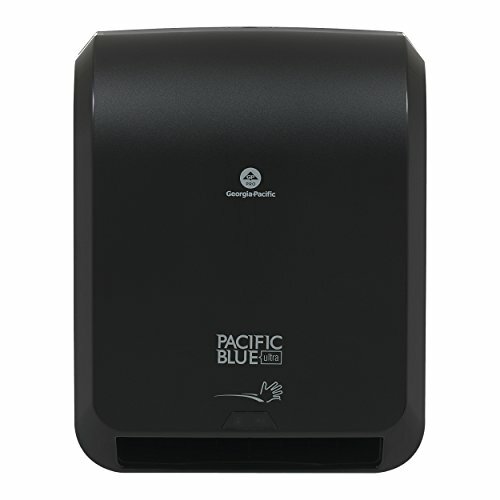 The company, founded in 1927, is headquartered in Atlanta, GA.
From the makers of enMotion products comes Pacific Blue Ultra Automated and Mechanical Paper Towel Dispensers. The automated dispenser features motion activation and touch-free dispensing, and the mechanical dispenser features a no-touch hang mode. 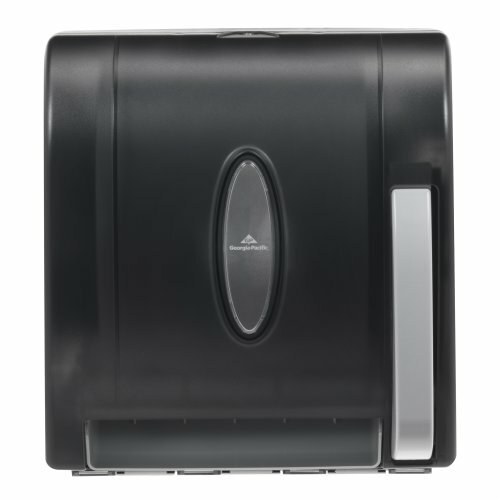 Both dispensers offer one-at-a-time, enclosed dispensing, so you only touch the paper towel you use. That helps cut down on germ transmission, and helps reduce waste. Dispensed towels are cleaner and more hygienic than stacked folded towels, and help cut down on maintenance. Unlike with folded towels, customers can t grab stacks of dispensed towels, so they re less likely to end up all over the floor. Both dispensers use the same paper towel refills, so they re a considerable value for the price. And refills for both dispensers are available in 3-roll and 6-roll cases, which helps control costs and maximize storage space. 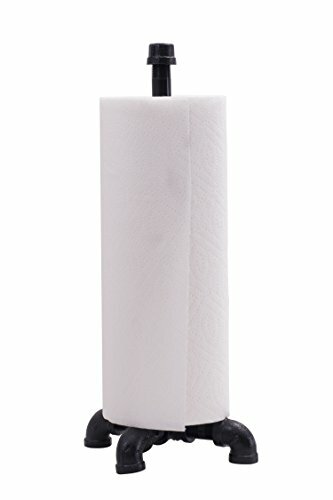 This dispenser s long-lasting paper towel rolls help reduce maintenance calls and run-out, and help you save money. Pacific Blue Ultra dispensers are also built to handle heavy usage, and are backed by a 5-year warranty. Your restroom is a reflection of your business. And incredibly, one-half of all customer complaints are restroom related. * All the more reason to put your best restroom forward. 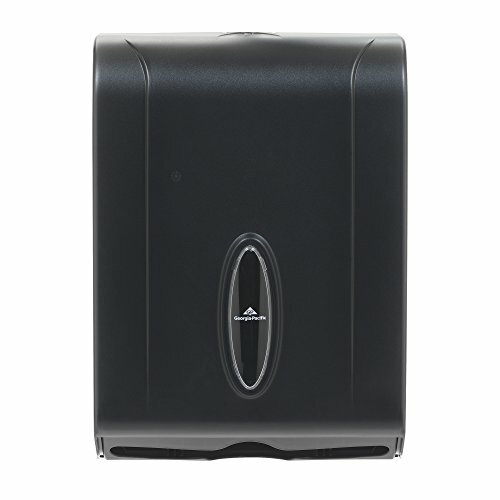 *Source: Cleaning & Maintenance Management: Building Service Contractor Survey, 2014 Pacific Blue Ultra Automated and Mechanical Paper Towel Dispensers are part of an entire family of high-quality products that give restrooms, breakrooms and workspaces a coordinated, clean, elevated image. 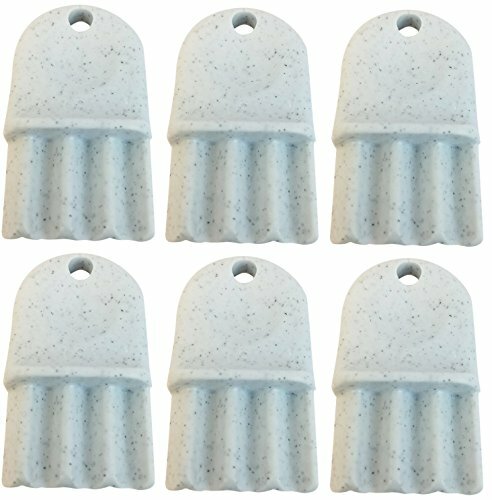 Pair with Pacific Blue Ultra paper towels [sku# s 26490, 26491, 26495, 26496], soap dispensers [sku# s 53057, 53058, 53060], soaps [sku# s 43714, 43715, 43818, 43819] and hand sanitizers [sku# 43335]. GP PRO is a division of Georgia-Pacific Consumer Products, LP. We deliver practical and easy-to-maintain solutions at every price point for businesses and building managers. This durable and versatile plastic towel dispenser holds up to 400 C-Fold, 600 multifold, or one package of BigFold towels to provide a cost-effective solution for washroom towel dispensing. This attractive see-through grey color complements any decor, and the covered key-lock design protects against waste and pilferage while making refilling towels quick and easy. When you have a small space, there s no need to sacrifice convenience and hygiene. With the MOD SlimFold Paper Towel Dispenser by Kimberly Clark Professional, you can install it in tight spaces, were typical paper towel dispensers are just too big. Nurses stations, tiny classroom sinks and small break room walls are a fit for this compact dispenser. However, don t let the small size fool you: each compatible Kleenex or Scott Brand towel is the same size as a regular folded towel (cleverly folded to fit). This innovative dispenser holds 225 folded towels, so you ll need to refill it less often (the clear vertical window lets you see when you re running low) and is designed for one-at-a-time dispensing, which reduces waste. Sink visitors will only touch the towel they use, providing a hygienic hand drying experience. This paper towel dispenser meets ADA requirements when properly installed and when using the recommended paper towel products. 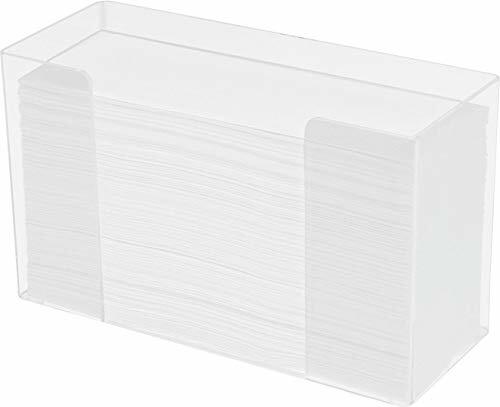 1 MOD SlimFold Paper Towel Dispenser / Case; White; Narrow wall mount unit measures 9.83" x 13.67" x 2.8"
Pipe D cor was founded by LDR Industries, a leading supplier of high quality kitchen, bath, plumbing and related products in the home improvement sector. Realizing that retail stores were quickly selling out of basic pieces, like flanges, the idea of Pipe D cor was born: an idea to help hobbyists find the products they need for their do-it-yourself, Pinterest inspired projects. With the rise of Pinterest and do-it-yourself projects, Pipe D cor is a way to showcase your creativity all while creating functional and visually aesthetic pieces that last. At Pipe D cor we're about the community; we're a channel where people can gauge new ideas, hear other people's stories, and learn about what items are available to create. Here at Pipe D cor we're modernizing pipes and using traditional materials in new innovative ways. We can't wait for you to join us on our journey! BRING THE FARMHOUSE LOOK INTO YOUR HOME with Pipe D cor. This complete set adds a high quality, handmade aesthetic to any room. Give your space a quick makeover and treat your visitors to your sense of style and attention to detail without the cost of a large remodel. Or complement your existing decorations with this versatile do it yourself design that will make you proud of your space. Includes everything you need to assemble and mount one paper towel holder. DELIGHT GUESTS AND BUILD FUNCTIONAL CONTEMPORARY FLAIR. Your room is sure to be a topic of conversation with this trending and stylish decoration. Pipe D cor combined with a little creativity can go a long way to update your space without breaking the bank. Constructed from extremely sturdy and durable material, Pipe D cor looks great without sacrificing functionality. Express your ingenuity and decorate with Pipe D cor. INCLUDED: This paper towel holder kit consists of: (1) 1/2 inch cap, (4) 1/2 inch 90 degree elbows, (4) 1/2 inch X 1.5 inch connectors, (1) 1/2 inch 5-way connector, (1) 1/2 X 12 inch, step-by-step instructions, as well as a clean and seal sheet. Everything that you need to create a fantastic looking rustic paper towel holder is here! MADE WITH HIGH QUALITY AND DURABLE PIPE FITTINGS. You will know Pipe D cor parts and accessories when you hold them. Beauty and beast. Strength and fashion. This is real industrial pipe finished for your decoration and designs. Accept no substitutes. Extra pieces and accessories are available for your custom fixture projects and expansions. Plug and play as desired. Limited warranty. Manufacturer part number 365 KITPTHR. CLEANING AND SEALING IS REQUIRED: This paper towel holder kit is comprised of genuine unfinished pipe fittings, which should be cleaned and sealed before assembly. Please be aware that the 12 inch pipe will have a slight coating on it, which some people mistake as being dirty. That is simply industrial pipe's natures. This pipe is standard industrial steel grey and meets both ASME and ASTM standards. These components have been tested for durability and are constructed of cast iron. Maximize your wall space with Spectrum s Large Pegboard & Wall Mount Basket. 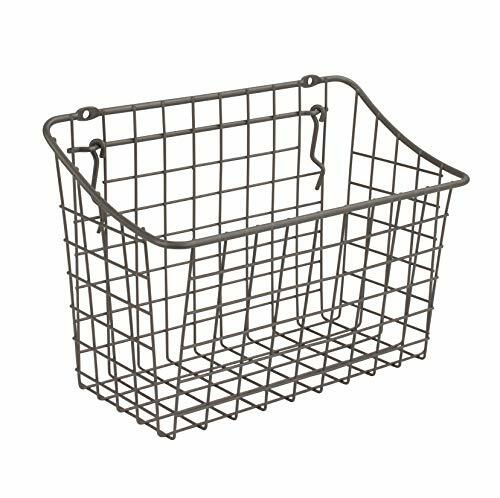 The basket is designed for use on standard pegboards (1/4" pegboard holes spaced 1" apart, center to center) and slat walls. Also includes hardware for mounting on walls. Keep frequently used items organized and easily accessible. Made of sturdy steel. Great for kitchen, bath, laundry room, garage, craft room or workshop organization. 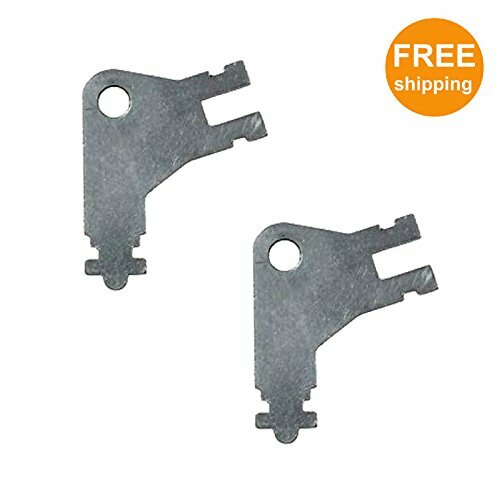 hardware included for mounting on walls and built in peg hooks. 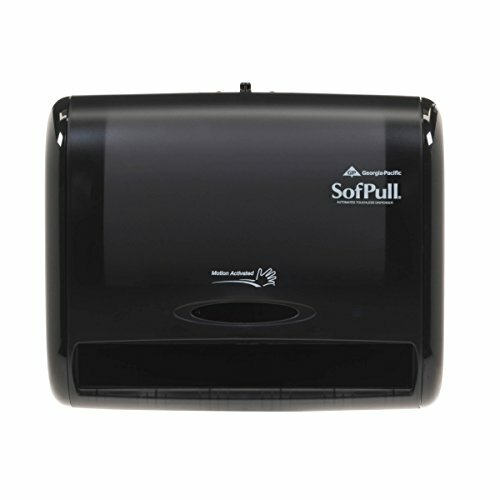 This dispenser is only compatible with SofPull refill 26610. SofPull paper towels are soft for thorough, gentle hand-drying, yet strong and absorbent for light cleanups. And because these towels are thick and high quality, employees and patrons tend to take fewer, helping to reduce waste. The dispenser s one-at-a time design helps reduce waste and, because contact with the dispenser is minimized, there is less risk of cross-contamination. The dispenser is designed to not only dispense one-at-a-time, every time, but refilling is quick and easy, saving on maintenance time. Use these premium paper towel systems in restrooms, break rooms, waiting rooms, food preparation areas and more. GP PRO is a division of Georgia-Pacific Consumer Products. We deliver well-designed, durable and easy-to-maintain professional solutions to meet the handwashing and cleaning needs for a range of business applications. 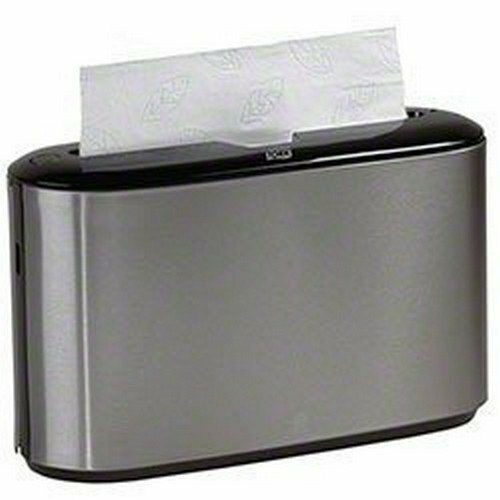 The Tork Xpress Countertop Interfold-Multifold Hand Towel Dispenser is a stylish countertop towel dispenser that adds a hygiene, upscale touch to restaurant restrooms. The dispenser utilizes a unique folded towel system with fully enclosed towels that delivers only one towel at a time, minimizing the risk of cross contamination while reducing waste and refilling expenses. The dispenser's attractive space-saving design is more appealing and less wasteful than a stack of loose towels, keeping countertops neat and creating an inviting impression. The Xpress Countertop Dispenser features a smooth surface for optimum hygiene, quick check refill level indicator, easy access buttons for fast refills, the overfill protection and spring-loaded bottom improve dispensing and the anti-slip pads keep dispenser in place. H2 Xpress interfold hand towel system. Replaces 301087A. Also available in White 302020, Black 302028.
opens most georgia pacific or san jamar towel dispensers. 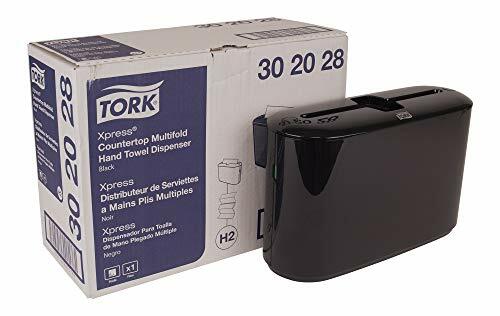 The Tork Xpress Countertop Multifold Paper Hand Towel Dispenser serves as a great alternative to providing a stack of loose paper towels on the washroom countertop. 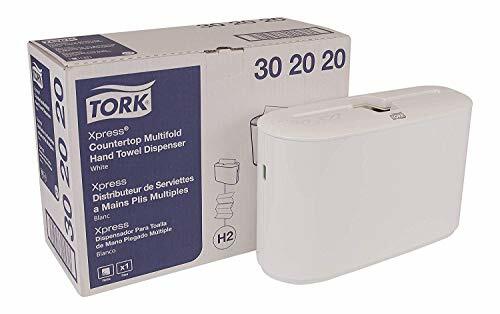 Tork Xpress Countertop Dispensers provide a functional, modern design that makes a lasting impression on your restroom visitors. The compact size is ideal when space is limited or mounting is not possible. Offers an upscale look and is more hygienic than a stack of paper towels to prevent cross-contamination. One-at-a-time dispensing reduces cost-in-use and waste. ADA Compliant. Black. Can be used with Tork 100297, 101293, MB540A, MB550A, MB554, MB558, MB560A, MB568, MB570, MB571, MB572, MB574, MB578, and MK520A Multifold Paper Towels. Bring chic and rustic design into your kitchen with this industrial style counter-top paper towel holder. Made from high-quality durable iron and electroplated to prevent rusting, this paper towel holder is sure to enhance. Complete with super easy step-by-step illustrated instructions for easy assembly. Pipe D cor was founded by LDR Industries, a leading supplier of high-quality kitchen, bath, plumbing and related products in the home improvement sector. Realizing that retail stores were quickly selling out of basic pieces, like flanges, the idea of Pipe D cor was born: an idea to help hobbyists find the products they need for their do-it-yourself, Pinterest inspired projects. With the rise of Pinterest and do-it-yourself projects, Pipe D cor is a way to showcase your creativity all while creating functional and visually aesthetic pieces that last. At Pipe D cor we're about the community; we're a channel where people can gauge new ideas, hear other people's stories, and learn about what items are available to create. Here at Pipe D cor we're modernizing pipes and using traditional materials in new innovative ways. We can't wait for you to join us on our journey! BRING THE FARMHOUSE LOOK INTO YOUR HOME with Pipe D cor. This complete set adds a high quality, handmade aesthetic to any room. Give your space a quick makeover and treat your visitors to your sense of style and attention to detail without the cost of a large remodel. Complement your existing industrial pipe shelves and decorations with this versatile do it yourself design that will make you proud of your space. Includes everything you need to assemble and mount one paper towel holder. 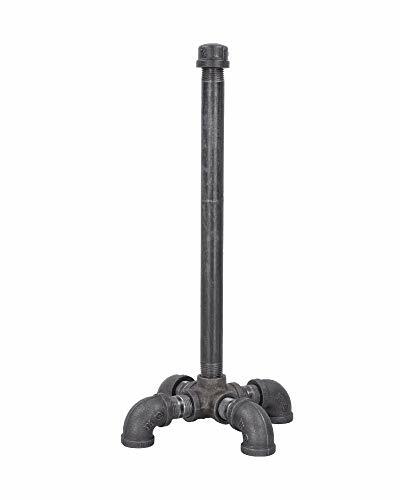 INCLUDED: This paper towel holder kit consists of (1) 1/2 X 12 inch pipe connector, (4) 1/2 inch X pipe connectors, (4) 1/2 inch 90 degree elbows, (1) 1/2 inch 5 way connector, (1) 1/2 inch cap, and a set of step by step instructions. MADE WITH HIGH QUALITY AND DURABLE PIPE FITTINGS. You will know Pipe D cor parts and accessories when you hold them. Beauty and beast. Strength and fashion. This is real industrial pipe finished for your decoration and designs. Accept no substitutes. Extra pieces and accessories are available for your custom fixture projects and expansions. Plug and play as desired. Limited warranty. Manufacturer part number 364 12PTHLDR-BK. ELECTROPLATED FOR YOUR CONVENIENCE: If you are looking for the industrial look without the dirt and hassle of having to clean and seal unfinished pipe yourself then you have come to the right place. Electroplated finish means no mess, grease, or oil to deal with before assembly. These pair wonderfully with rustic shelving and a variety of styles. 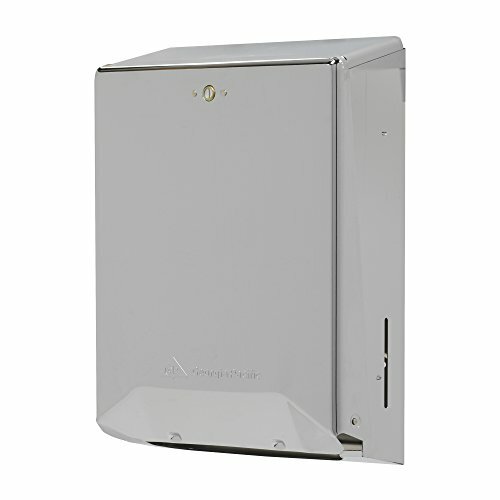 The Alpine wall or cabinet-mounted paper towel dispenser is a practical and attractive solution to paper towel dispensers when you reach for a single towel or, multiple towels to clean up major spills. Single towel? Pull from the bottom. Many towels? Grab from the top. And you'll always know when it's time to refill your Alpine paper towel dispenser thanks to the refill slot. Available in clear or black acrylic they easily accommodate the popular big fold, C-fold and multifold refills widely available on the market. These paper towel dispensers come with a protective, peel off plastic film that protects their surface during shipment. HIGH-QUALITY CONSTRUCTION. This Wall-Mounted Towel Dispenser is durably made utilizing acrylic material to provide long-lasting strength and use. Lightweight yet shatter-resistant, acrylic won't break even if it falls and hits the ground! MULTI-PURPOSE DISPENSER. Available in black and clear to easily complement any interior design, the Alpine Industries can be used in kitchens, workshops and restrooms in any location - churches, offices, hospitals, food service industries, schools and more. QUICK, EASY INSTALLATION. The dispenser is equipped with mounting holes and comes with included hardware for easy and fast installation. As such, you can attach the dispenser onto any wall, cabinet or flat surface in no time flat. PRACTICAL TOWEL DISPENSER. This paper towel dispenser easily accommodate the popular big fold, C-fold and multi-fold refills widely available on the market. When you need a single towel, simply pull from the bottom and when requiring many towels, grab them from the top. SPACE-SAVING DESIGN. Free up counter space in any high traffic location. The towel dispenser has a 150-towel capacity and features a filling slot design so you can easily see when towels need to be replenished. Practical and stylish, the AdirHome Bamboo Paper Towel Dispenser is a great substitute to those mundane-looking dispensers. 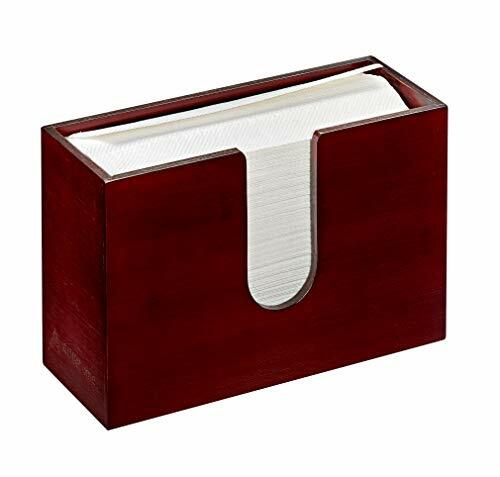 This eye-catching accessory beautifully finished in popular natural and espresso finishes will make a statement about your good taste by avoiding institutional dispensers often associated with public and office complex lavatories. Sturdy and durable to provide long-term use, this towel dispenser is crafted out of sustainable bamboo to furnish a natural look while keeping the forests intact. More resistant to damage than traditional hardwoods, this food-safe material contains no chemicals or formaldehyde and is a great, natural alternative to wood. Holding up to 150 multi-fold paper towels, the AdirHome accommodates all multi-fold paper towels so you can select your favorite vendor. The smoothly finished dispensing slot is designed for simple, tear-free retrieval, while the filling slot design allows you to easily see when towels need to be refilled. When wall mounted using supplied hardware, towels can be conveniently retrieved individually from the bottom. If cleaning up spills, multiple towels can be grabbed from the top to meet your needs. If you prefer to place your dispenser on the counter, the supplied slip-resistant, silicone footpads help to keep it in place. Use the AdirHome Towel Dispenser to replace often-used terry towels in your main bathroom or guest room bathroom, on kitchen counters or walls, or in your garage or workroom in the home. It can also be used in public lavatories in restaurant, clubs and offices or in business break rooms or kitchens to enhance any decor. HIGH-QUALITY CONSTRUCTION. This Bamboo Paper Towel Dispenser is skillfully made from sustainable, forest-sourced bamboo to provide long-lasting strength and use. This natural alternative to wood contains no chemicals or formaldehyde, and is resistant to moisture and bacterial growth to hold up to everyday wear and tear. ATTRACTIVE ACCESSORY. Available in beautifully finished natural or espresso bamboo, the AdirHome is an attractive alternative to those mundane-looking paper towel dispensers. Place it in a bathroom, kitchen, garage, workroom, restaurant or club and make a bold statement regarding your good taste. QUICK, EASY INSTALLATION. The dispenser is equipped with mounting holes and comes with included hardware for easy and fast installation onto any wall, cabinet or flat surface. If desired, you can also set it on the counter and use the supplied slip-resistant, silicone footpads to keep it in place. PRACTICAL TOWEL DISPENSER. This paper towel dispenser is designed to accommodate all multi-fold paper towels so you can select your favorite vendor. When wall mounted, towels can be retrieved individually from the bottom to wipe your hands or multiple towels from the top for cleaning up spills. SPACE-SAVING DEIGN. Free up counter space in any high traffic location. The towel dispenser has a 150-towel capacity and features a filling slot design so you can easily see when towels need to be replenished. Brand Cq acrylic has set the standard for personal customer service, superior design and construction, a high degree of flexibility and responsiveness to the marketplace. 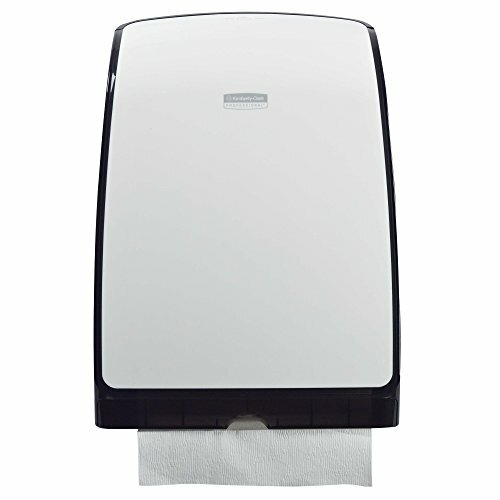 The Cq acrylic Paper Towel Dispenser is designed for use with virtually all C-fold and multi-fold paper towel brands. This towel dispenser protects towels from moisture and contamination. It can be placed on counter for use or Desk. The clear acrylic, one-piece construction is suitable for offices of all kinds. The clear acrylic, one-piece construction is suitable for restrooms and offices of all kinds. Keep your sink area organized and always have a paper towels in reach with the Cq acrylic Paper Towel Dispenser.